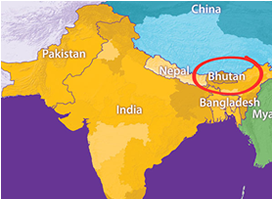 World Tour Plan > Why Visit Bhutan? One of the best aspects of visiting Bhutan is that it’s a place hardly visited by the tourists. Therefore, the chance of knowing about it even before reaching there is least. As a result, the visit will have a “surprising element” attached to it. The warmth of a country depends on the behavior of that country’s people largely. The Bhutanese people are sweet enough to say you ‘good bye’ (it is used to welcome people in Bhutan) with smiles always attached to their lips. Hanging on a cliff 10,200 feet above the city of Paro, the Tiger’s Nest Monastery was completed in 1692. The monastery was restored after it suffered blazes from a butter lamp. It is believed that Padmasambhava (Guru Rimpoche) flew there on the back of a tiger. It is one of the most sacred places of the country. The Takin, the national animal of Bhutan is said to have been created by Lama Drukpa Kunley (also known as Divine Madman) by cutting off a goat’s head and attaching it to a cow’s body. Monkees, also known as little-kid monks in their orange robes are a cute sight to watch. It can be called as an ‘adventurous dining’. The Ema Datse, Bhutanese National Dish is a mixture of chilies and cheese. It is really hot, so always venture into these with proper arrangements of water or you will be left sputtering, coughing and sweating profusely. Watching a Bhutanese eat these with ease may make you wonder whether the Bhutanese are born without their taste buds. If you want to give away the addiction of going to Mc Donald’s, Bhutan is the best place to be. You won’t find a single Mc Donald’s, a nice break from your everyday life. The pulse of Bhutan is reflected and seems to be ruled by “Gross National Happiness” and not Gross Domestic Product. The people out here are so happy irrespective of what is happening in the share market. In addition, it seems there will never be a ‘recession’ in their happiness. There is more to Bhutan’s scenic beauty. The fast flowing rivers, the winding roads and the varying terrain provide ample avenues for activities like mountain biking, river rafting, kayaking and many more.